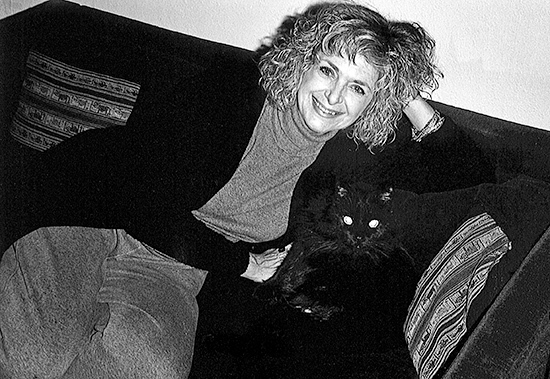 We were heartbroken to learn of artist Mary Giles’s passing last month. Giles was a light – casting warmth and humor wherever she went. We have been fortunate to represent her work at browngrotta arts for many years and were delighted she could join us in Wilton for our 30th anniversary exhibition last year. 30th Anniversary exhibit artist portrait. Giles reveled in the tactile, reflective and and malleable materials. 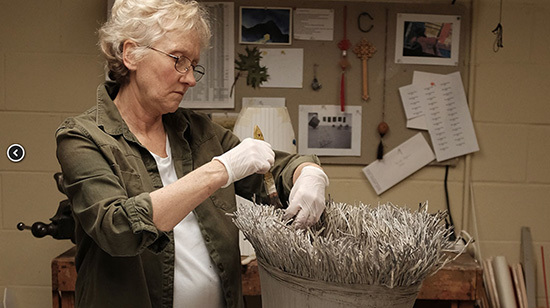 She is represented in the Erie Art Museum’s permanent collection by a meticulously made basket of porcupine quills. 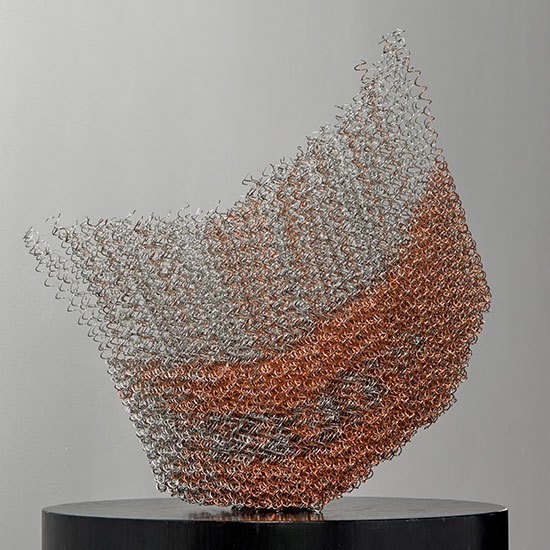 The materials she used on the surface of the coiled forms were individually hammered pieces of 12- to 18-gauge wire made of copper, tinned copper, iron, lead or brass. By torching the metals she was able to alter the colors in varying degrees enabling me to blend them from darks to brights, a blending she used to interpret the colors, textures and light that she saw in the natural settings. Some years ago Giles began creating wall panels that dealt with her concerns about population and explored ideas of density and boundaries. They were not baskets but the figures incorporated were like those that had been featured on her vessels. The first expression of this theme was composed of hundreds of torched copper wire men arranged outwardly from dense to sparse, directly on a gallery wall. Giles’ work has been displayed in numerous galleries and museums in the United States including the Barbican Centre in London, the Minneapolis Institute of Arts, the Yale Art Gallery and the Detroit Institute of Arts. 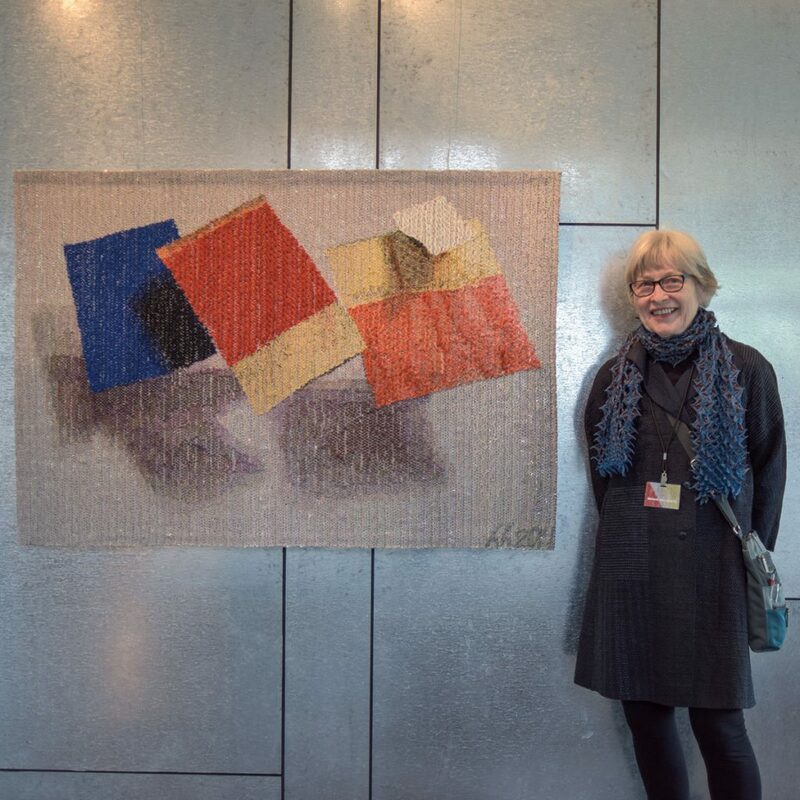 She represented the U.S. at the International Triennial of Tapestry in Lodz, Poland. 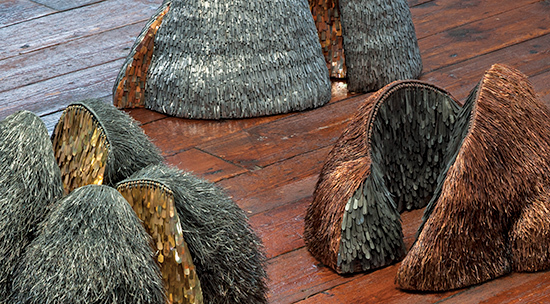 She is one of 20 artists featured in a current article in 1st dibs online magazine Introspective: “20 Women Designers Young and Resurgent Stand Side by Side,” which you can read here: https://www.1stdibs.com/introspective-magazine/tag/mary-giles/. 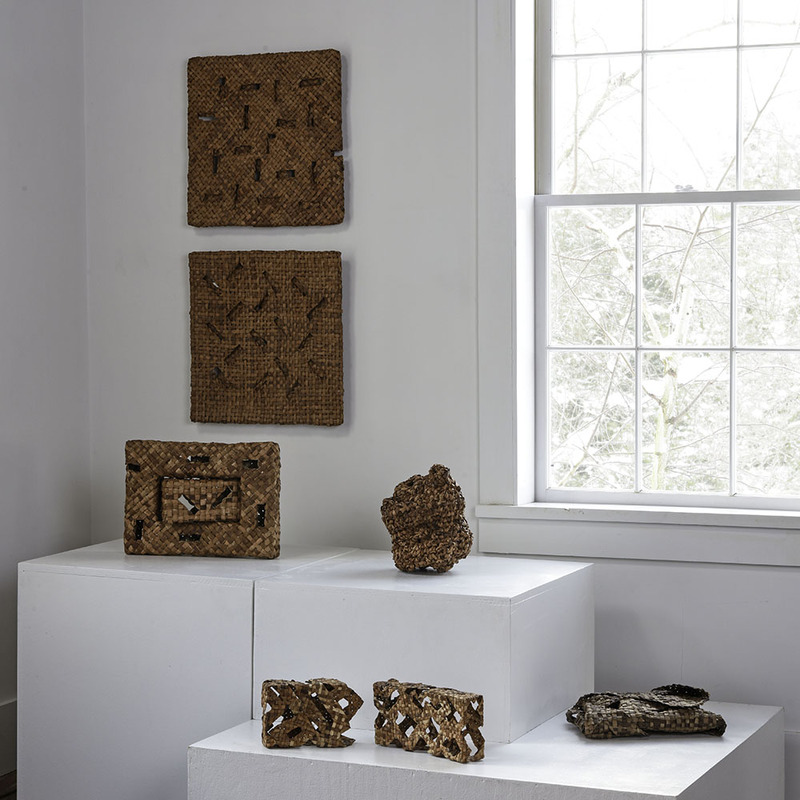 Her work is also featured in eight catalogs published by browngrotta arts available on our website: http://store.browngrotta.com/sara-brennan-tapestry-and-mary-giles-fiber-sculpture/. For this year’s Art in the Barn exhibition, we asked artists to enter a blue or green period of their own and send us a work that conveyed one of the many meanings, connotations and moods of these colors. The result is Blue/Green: color/code/context, an exhibition of remarkably diverse works from more than 50 artists from 15 countries. Marian Bijlenga of the Netherlands, for example, has created an enigmatic wall work inspired by Dutch blue china fragments. 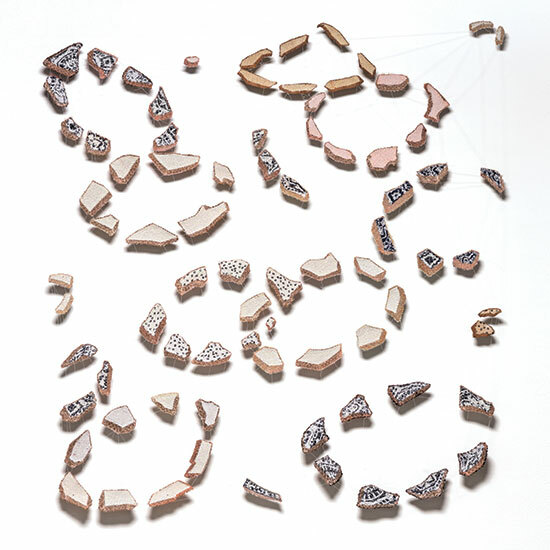 The work is inspired, she says, by the patterns of Chinese porcelain and the Japanese philosophy of the reuse of broken tiles and her collection of Dutch blue shards, collected in Amsterdam. Sunday April 29th – Sunday May 6th, Viewing Hours 10-5 pm. For more info: http://www.browngrotta.com/Pages/calendar.php; 203-834-0623. This year’s exhibition is co-sponsored by Litchfield Distillery. “In Japan,” writes influential basketmaker Hisako Sekijima,”the idea of making ‘non-utilitarian baskets’ is still not so properly appreciated even after 30 years! 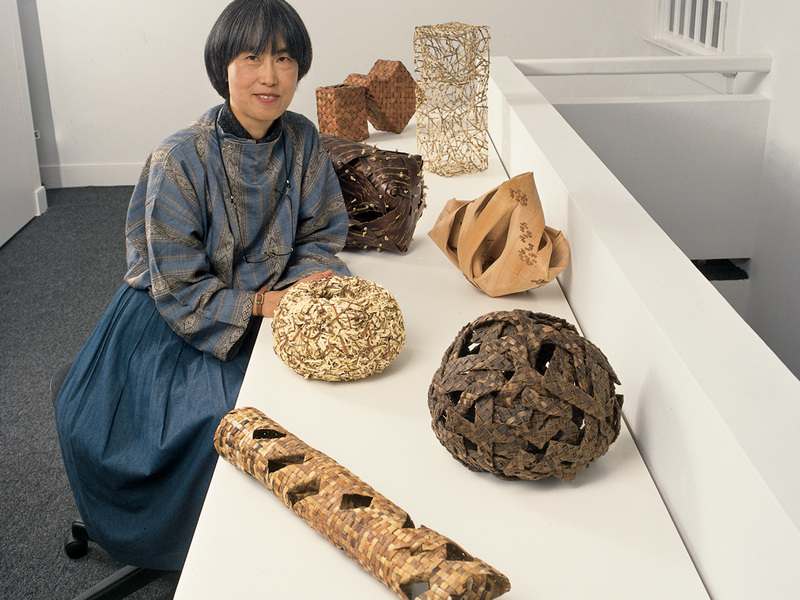 !” Undaunted, for three decades, Sekijima and a loosely organized group of 80 or so other artists have continued to pursue what she calls contemporary basketmaking, but the Victoria & Albert Museum terms a “journey of radical experimentation,” maintaining a website, newsletter and mounting an annual exhibition in the process. For the 30th anniversary of this exhibition at the Yamawaki Gallery, Chiyoda-Ku, Tokyo, this fall, Sekijima wrote text to refresh insider artists’ vision and to expand the understanding of outsiders, artists and their audience. The statement below is adapted from that text. 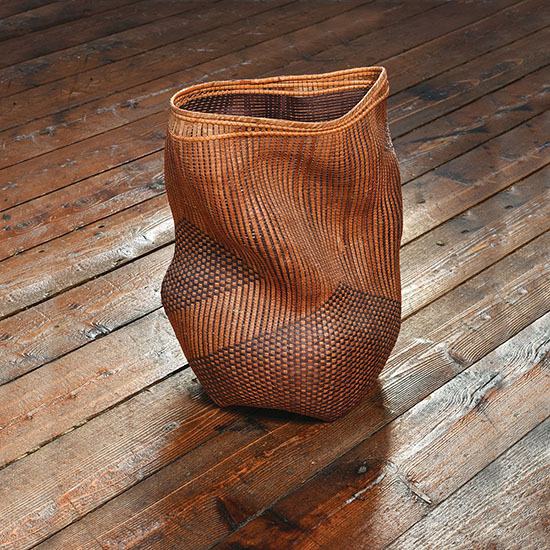 Ed Rossbach’s Baskets as Textile Art lead to a surge of contemporary basketmaking in 1970s. The notion of baskets, as stated well in its title, has been spreading and stimulating basketmakers’ creative minds beyond US, to other countries in the world. In Japan, basketmakers have committed significantly to this worldwide, challenging trend in the last 30 years. Their output has been found in show catalogs as well as international publications, for example, those published by browngrotta arts. 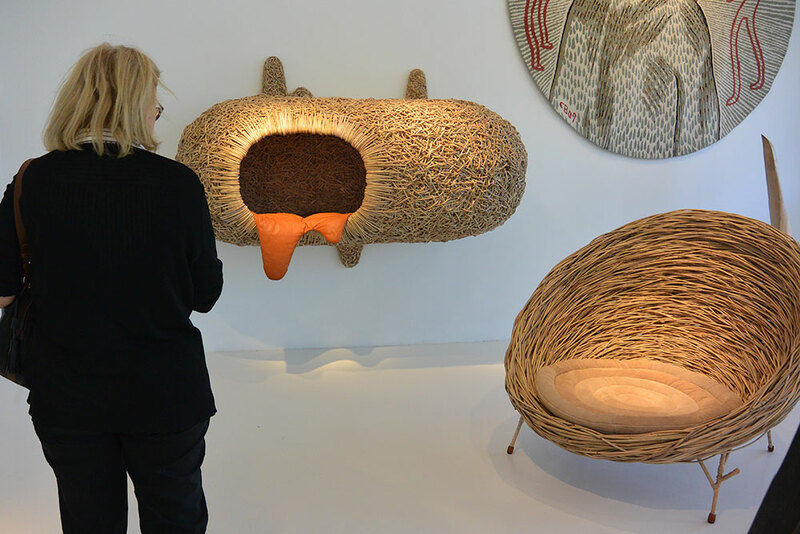 I can explain first, why this notion of baskets is new and also, why it was taken up with interest by a wide range of makers. Prior to the 70s, baskets had been discussed either in terms of ethnology/folk culture or in relation of certain local traditional connoisseurship in tea ceremony, flower arrangement and daily life style design. In Rossbach’s book baskets were re-evaluated beyond those local cultural and historical confinements. That is, baskets were abstracted in their formal or conceptual expressive possibility. Baskets came to be challenged from various angles without consideration of conventional requirements. More recent results of this challenge include exploration of new material/structure, or of new spatial expression of linear elements. 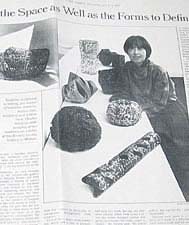 In 1999, at Yokohama Art Museum, an exhibition, Weaving the World, presented a term, “contemporary art of linear construction” to link a wide range of artistic expressions from artists including John McQueen, Norma Minkowitz, Hisako Sekijima, Kyoko Kumai along with Martin Puryear, Richard Deacon and Oliver Herring. This new context resulted in a fresh look of sculptural works which were not carved nor molded but made of linear substances. Baskets and fiber arts spoke clearly there. More recently, in April 2017, I saw Women Artists in Post-War Abstraction at the Museum of Modern Art in New York, another show affirming the dawn of contemporary textile arts as an abstract expression. Under the category of “Reductive Abstraction” were combined works by Abakanowicz, Anni Albers, Sheila Hicks and Kay Sekimachi. Well expressed by the works in the exhibition was these artists’ eager search for abstract expression, which they did by depriving textile techniques of conventional functions, materials and pictorial patterns. Though Rossbach was not there in the show featuring “women artists,” I was sure his new attitude toward baskets was rooted in the same soil. 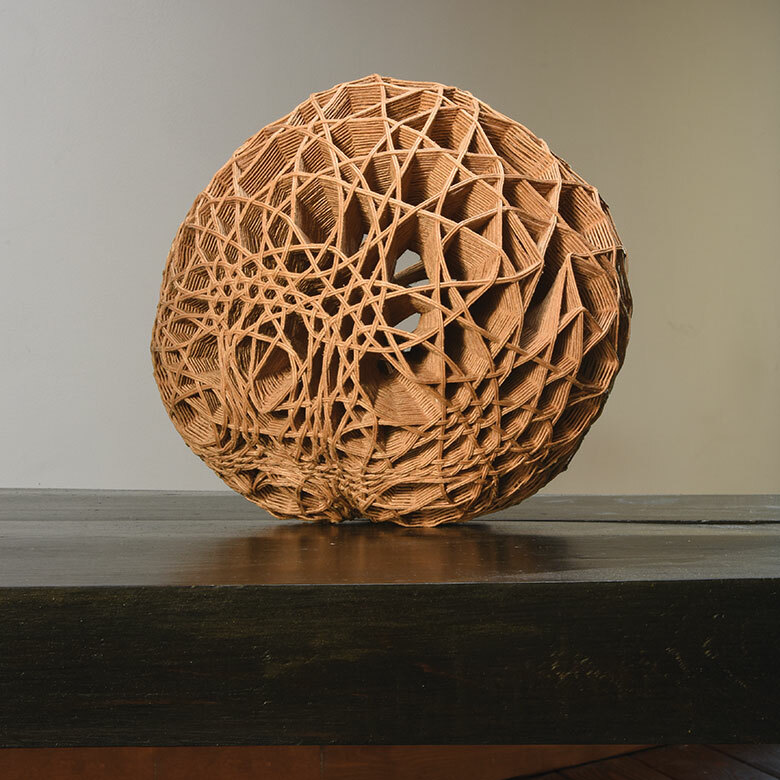 Through 1980, I explored basketmaking, especially focusing on the interplay of material and structural mechanism. And I started a class to introduce a conceptual approach to basketmaking in Japan. Some of my students from that period have been presiding over an annual basketry show since then to cultivate a new ground in Japan. The first show was held at Senbikiya Gallery, Chuo-ku Tokyo in 1986.The objective was then, and still is now, to generate mutual learning and promotion. In Japan, compared with the government-supported field for traditional art bamboo basketry and mingei folk basketry, the field for the contemporary basketry remains small and still not well known. The group avoided forming a so-called art/craft association or exclusive school of a core artist. I knew that in the Japanese cultural climate such attempts had seen quick rise and fall in a short time, for the exclusive/authoritative nature of organizations tends to distort its original ideal. It is a shared regard that binds our group and the conviction that each should be a leader to oneself and to the group, besides being a creative basketmaker. We’ve aimed to keep the group healthy and growing. A kind of standing committee is organized for each exhibition. Administrative jobs and budgets are shared equally and paid accordingly among the participants. Besides entry fees, the sales of the catalog and a 10% commission from sold works cover the costs. Often we win an invitational support or a subsidiary discount of the rental fee from galleries or art schools. Over time, the regular participants have learned to create show announcements and catalog booklets by computer and to set up a job grading for payment to the respective participants for contributed works. And all of the participants are now able to submit their own pages in digital data to a catalog editor. Each participant has individual pages of work and a statement of intent in the catalog. For new entries, anyone can submit a portfolio one year in advance. These are reviewed by all of the exhibitors during the ongoing show. Considerations are made not only for the work but also for the administrative contributions. It is not a juried show, but each participant should be responsible to preserve or better the quality of the show both aesthetically and operationally. 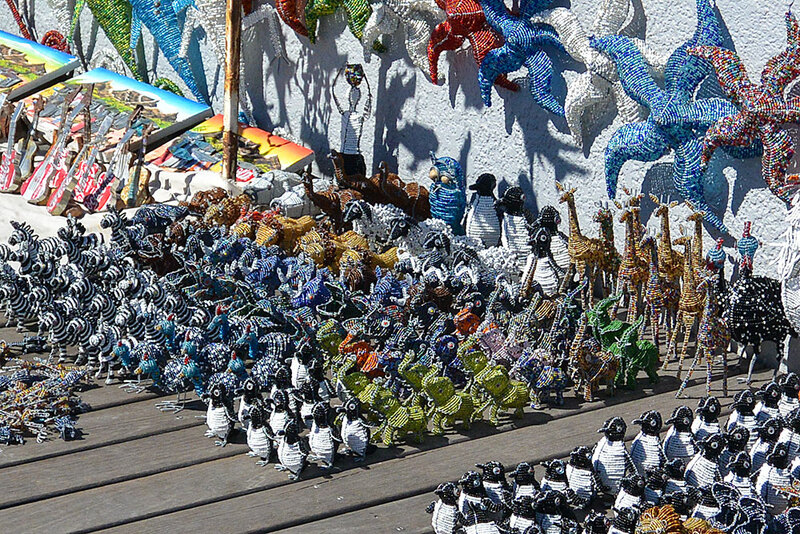 Eighty artists have participated over the years — about 30-40 artists participate each year. Participants have included Noriko Takamiya, Kazue Honnma, Tsuruko Tanikawa, Chizu Sekiguchi, Hisako Sekijima, Shoko Fukuda, Masako Yoshida, Shigeru Matsuyama, Rittsuko Jinnouchi, Nobuko Ueda, Haruko Sugawara. Long-time participants such as Noriko Takamiya, Kazue Honma, Tsuruko Tanikawa and me have adopted our own co-operational, open system to keep the show going. We have been careful that this group activity not be for the benefit of exclusive members but should promote independent creative minds through basketmaking. 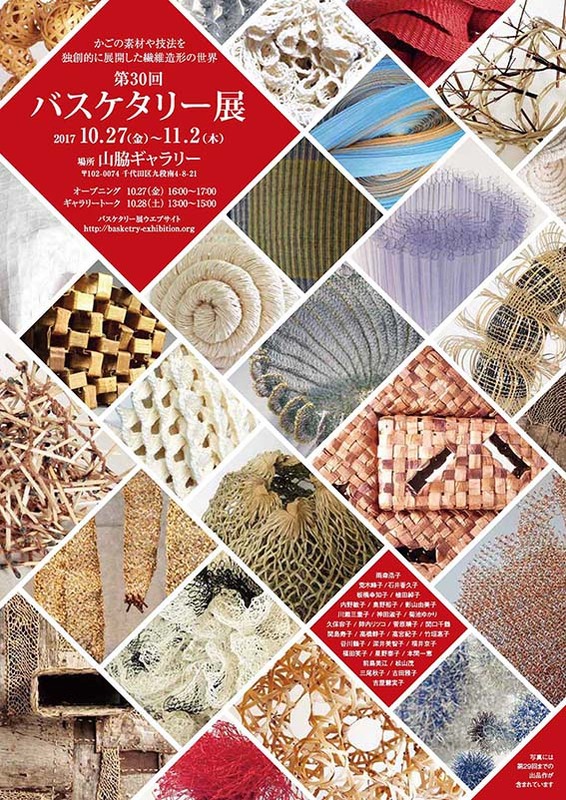 Besides the annual exhibition, Kazue Honma’s editorship of Basketry News Letter and Noriko Takamiya’s handling of our website have been instrumental in keeping this loose group intact. The long list of topics include not only international exhibitions but also iworkhops, technical analysis into structure, experiments/researches of plants, accomplishments in archaeological reproduction and social commitments in developing countries.This year 350 people attended the exhibition, including art writer Janet Koplos and Scandinavian artists, Ingrid Becker and Kristin Opem and Professor Wu, Pei-shan, and students from the Textile Section of the Graduate Institute of Applied Arts of Tainan National University of Arts. 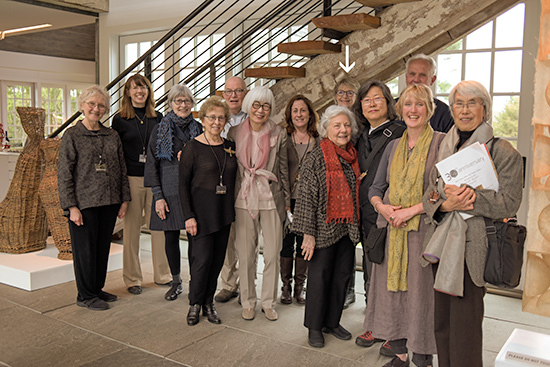 We wish Sekijima and her fellow artists another creative and inspiring 30 years! July seemed to fly by here at browngrotta arts, but we still featured a full complement of New Art This Week. 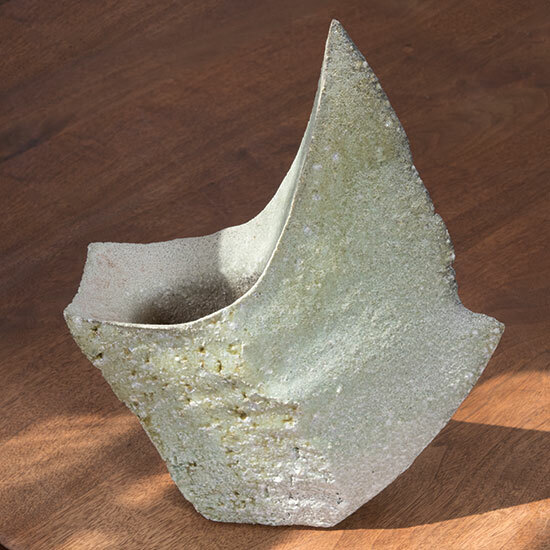 This month we had new pieces from Polly Adams Sutton, Jennifer Falck Linssen, Åse Ljones and Lenore Tawney. 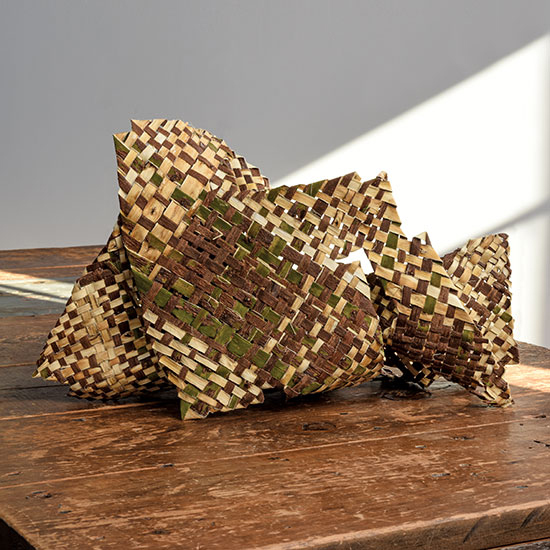 Polly Adams Sutton’s basket Shady Lane is hand woven from pieces of western red cedar bark. With permission from logging operations, Sutton harvests the bark herself in the spring when the sap is running up from the roots of the trees. During her time spent collecting bark in the woods Sutton mulls over possible new forms she can weave. The manipulative qualities of cedar are the cornerstone of Sutton’s work, allowing her to bend the cedar as she desires. Through works like Lucent, Jennifer Falck Linssen explores the “delicacy of nature, the beauty of line, and the transformation of light and space.” By investigating both natural and manmade forms Linssen investigates how patterns lead to the overall strength of an objects, such as the veins in a plant or the structure of a moth’s wings. 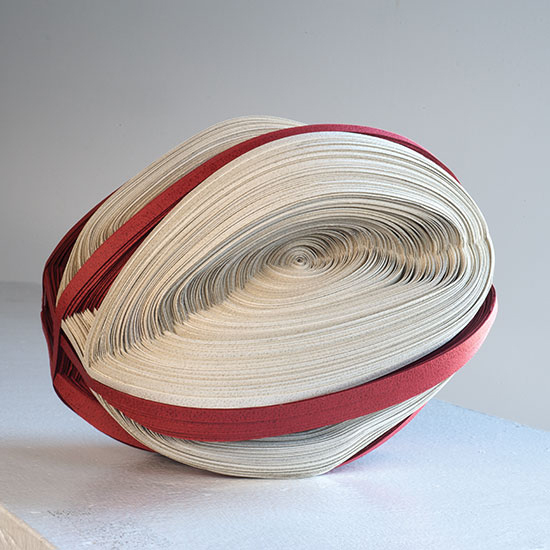 In her work, Linssen uses the ancient Japanese paper carving technique katagami. Katagami allows Linssen to bridge the gap between “human scale, the minute and intimate, and the vast and grand by freezing a moment in time, immortalizing it in pattern, light, and shadow.” Through these frozen moments, Linssen is sees humanity reflected in nature’s change, rebirth, resiliency and endurance. 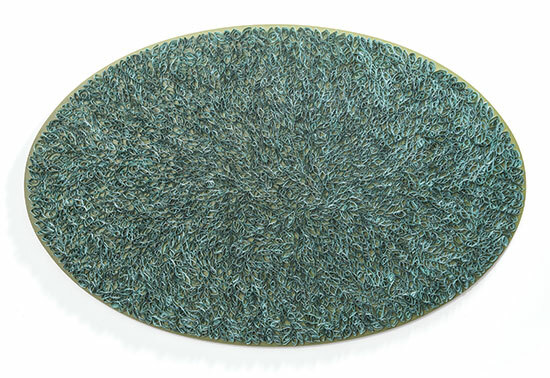 Åse Ljones’ hand-embroidered tapestry Sound on the Fjord reflects Ljones’ upbringing on a small rural farm, where sea and nature were close by. Ljones starts her embroidery at either the corner or center of a piece of fabric. From there she takes her time sewing, reflecting along the way. 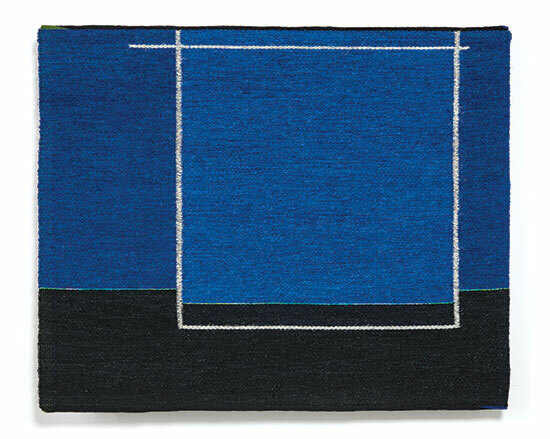 Ljones never sews a wrong stitch, believing that a mistake it often what creates a dynamic space. Tension is one in a series of graph paper and pen-and-ink drawings Lenore Tawney started in 1964 inspired by her study of the Jacquard loom. 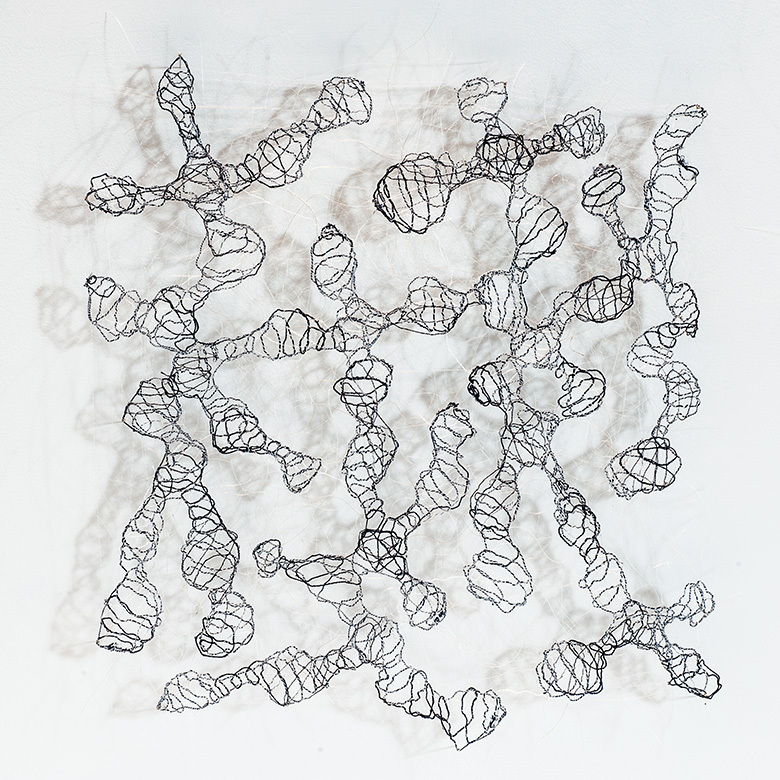 Later in the 1990s Tawney converted some of the pen-and-ink drawings into thread sculptures in a series titled Drawings in Air. 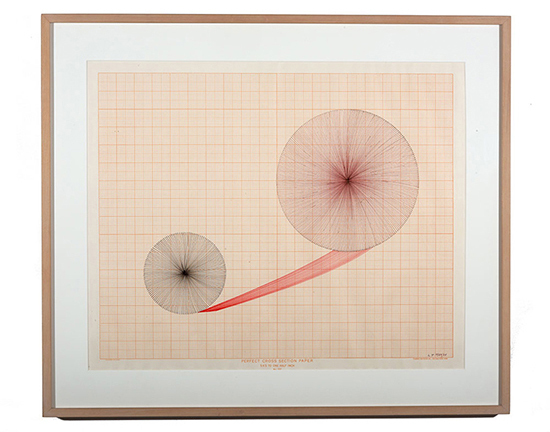 Tawney’s geometric explorations predated Sol Lewitt’s celebrated grid drawings, which were first exhibited by Paula Cooper in 1968. 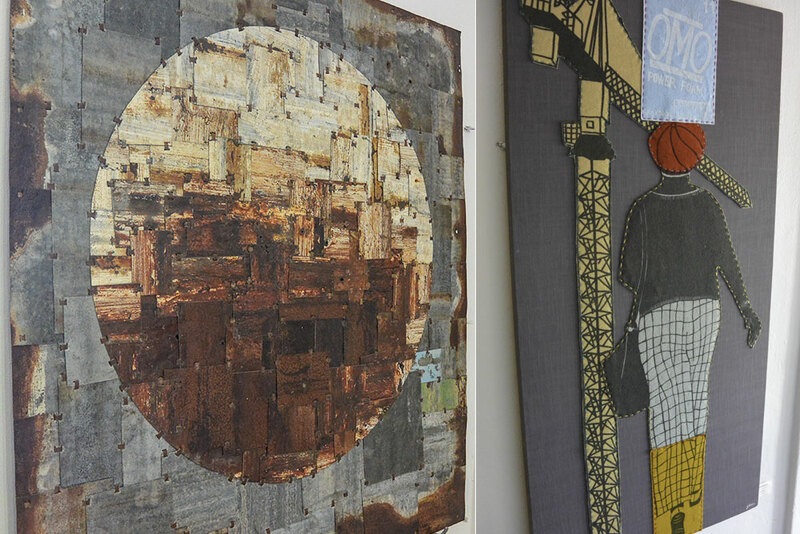 Tawney, whose work shaped the course of fiber art during the second half of the 20th century, is also well known for her tapestries, collages and assemblages. 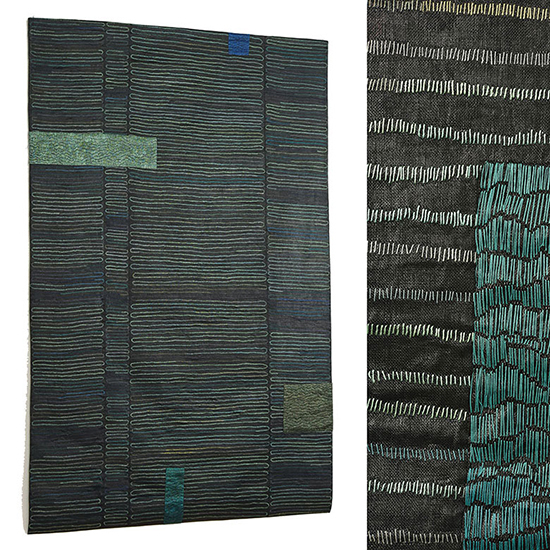 Helena Hernmark’s Tabula Rasa 3 , integrates an unusual background of polyester from sequin making that adds a glimmer to the tapestry in the right light. The work is part of a series that included the first Tabula Rasa, commissioned for Yue-Kong Pao Hall, Purdue University. 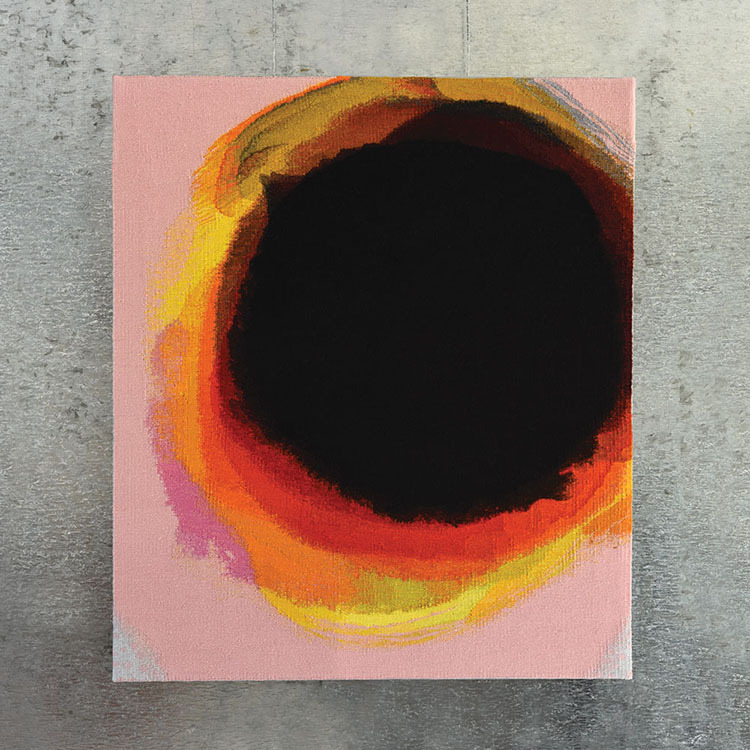 Dark Shimmer, by Scottish artist Jo Barker, is from the series for which she won the prestigious Cordis tapestry prize in 2016. 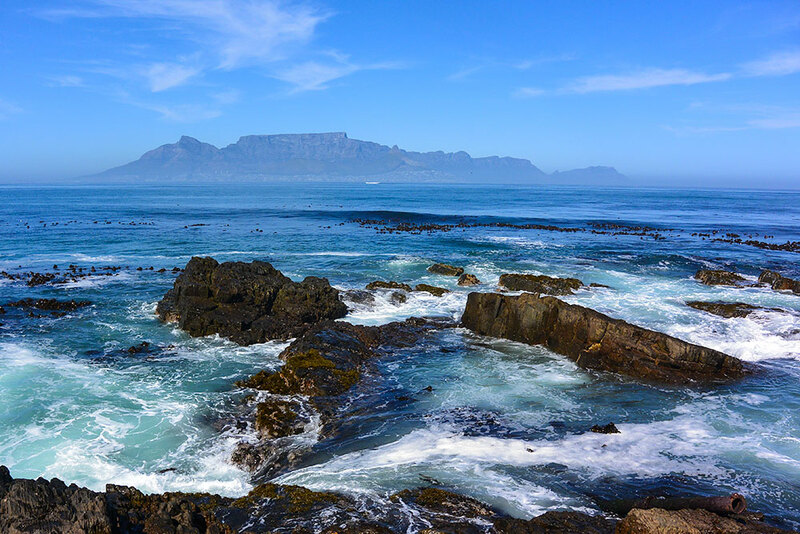 Water has long been a potent influence for artists wishing to explore its majesty and mystery. For the last several months, browngrotta arts has worked with Jamie Uretsky, Curator and Noelle Foye, Executive Director of the New Bedford Museum of Art/ArtWorks! in Massachusetts. Plunge: explorations from above and below, which examines the influence of water in the work of 16 artists from around the world, is the result. The multifaceted exhibition combines sculptures, tapestries, installation works, paintings and photography. Each work resides at the intersection of the maker’s fascination with a variety of nautical and natural themes and the artmaking process. 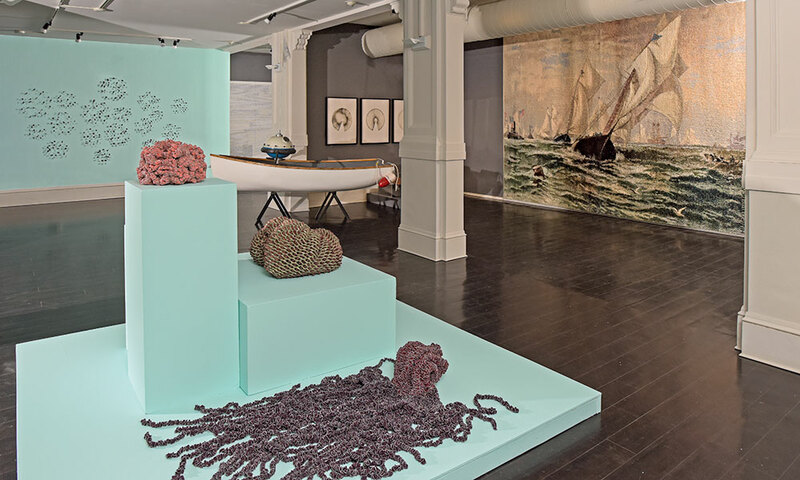 Plunge pairs Helena Hernmarck’s monumental woven depiction of tall ships in New York Bay 1884 and Chris Drury’s Double Echo, a print that superimposes a fragment of an echogram from Flight W34 over East Antarctica and an echocardiogram of the pilot’s heartbeat. 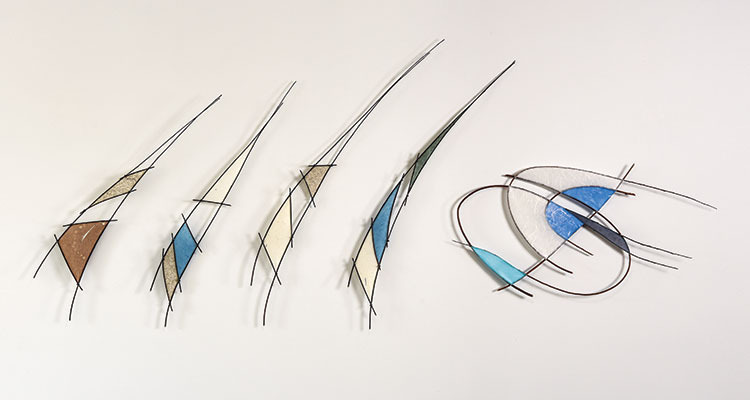 In other galleries, Heather Hobler’s meditative photographs of seascapes join Karyl Sisson’s “sea creatures” made of domestic objects like zippers and clothespins; Christopher Volpe’s evocative paintings join Grethe Wittrock’s Arctica, a sculpture made from a repurposed sail from the Danish Navy. Unlike most musuem exhibtions, the works in Plunge are all available for sale. 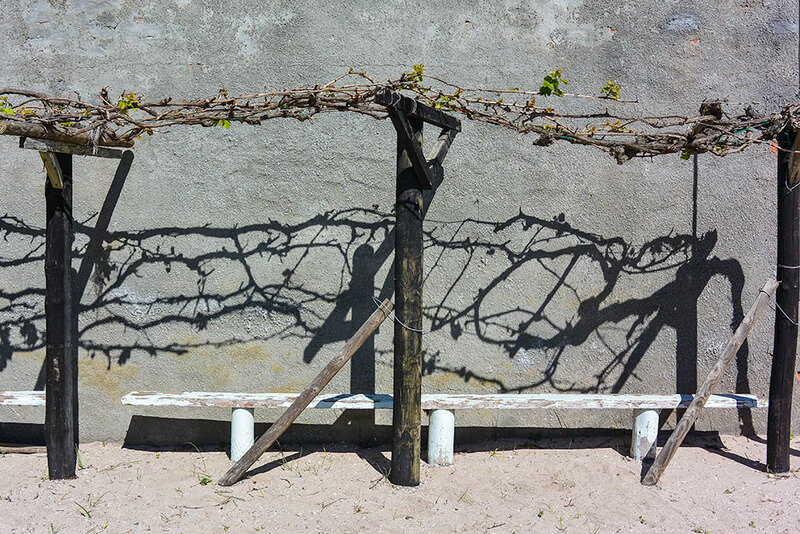 Thirteen of the artists in Plunge, representing five countries, are represented by browngrotta arts: Dona Anderson; Jane Balsgaard; Annette Bellamy; Marian Bijlenga; Birgit Birkjaaer; Chris Drury; Helena Hernmarck; Lawrence LaBianca; Sue Lawty; Judy Mulford; Karyl Sisson; Ulla-Maija Vikman; Grethe Wittrock. 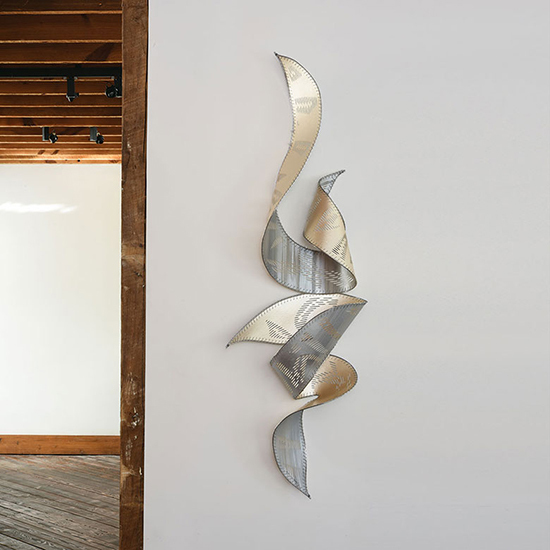 Their work, and that of the three other artists in the exhibition, Heather Hobler, Anne Leone and Christopher Volpe, will be included in the catalog for the exhibition, designed and photographed by Tom Grotta. It will be available beginning June 5th at www.browngrotta.com. 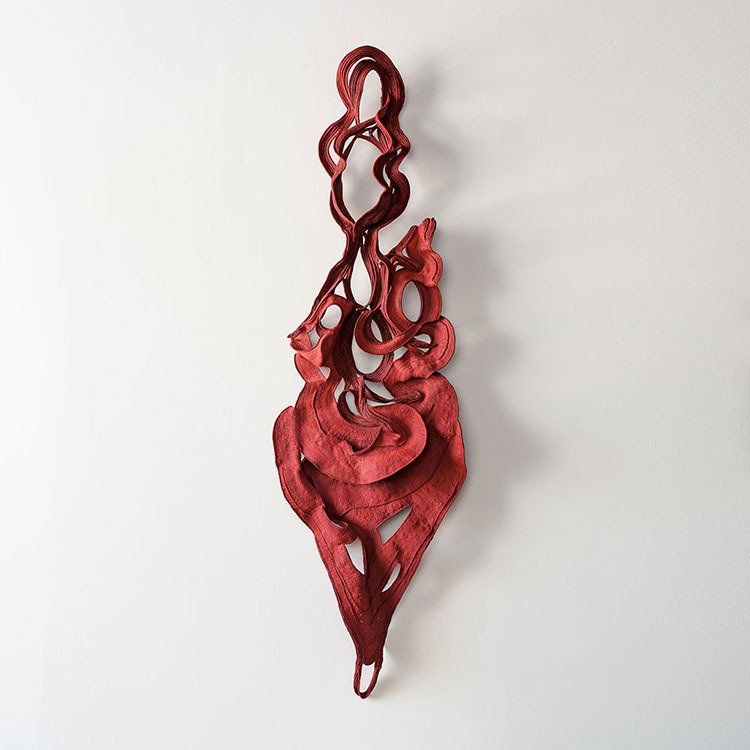 Plunge’s opening is tonight Friday, June 2nd at the New Bedford Museum of Art from 6 p.m. to 8 p.m. Jane Balsgaard, one of the artists in Plunge, will attend from Denmark. The New Bedford Art Museum is great cultural destination for those on the way to the Vineyard, Nantucket or the Cape. You have plenty of time to see it, as the exhibition continues through October 7, 2017. The New Bedford Art Museum/ArtWorks! is located at: 608 Pleasant Street/ New Bedford, MA/02740/508.961.3072/info@newbedfordart.org. April has been a busy month for us at bwongrotta arts. We’ve been celebrating our 30th Anniversary for the past 10 days so one of our new this week items was a short video about our 30th Anniversary exhibition, Still Crazy After All These Years…30 years in art. 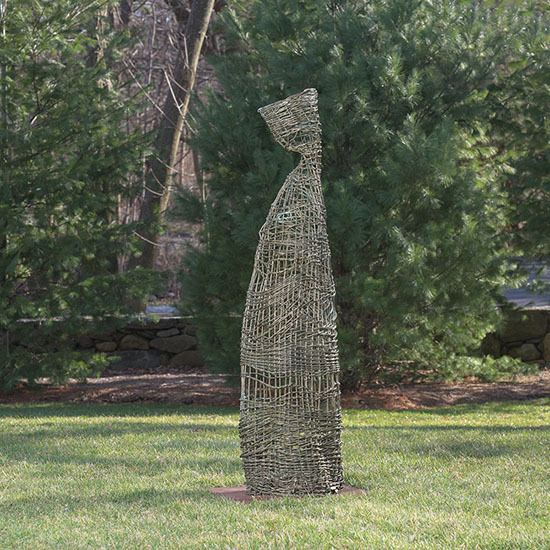 We added outdoor sculpture for this exhibition and highlighted Dawn MacNutt’s bronze work, Timeless Figure, which began as a willow sculpture before it was cast in bronze. 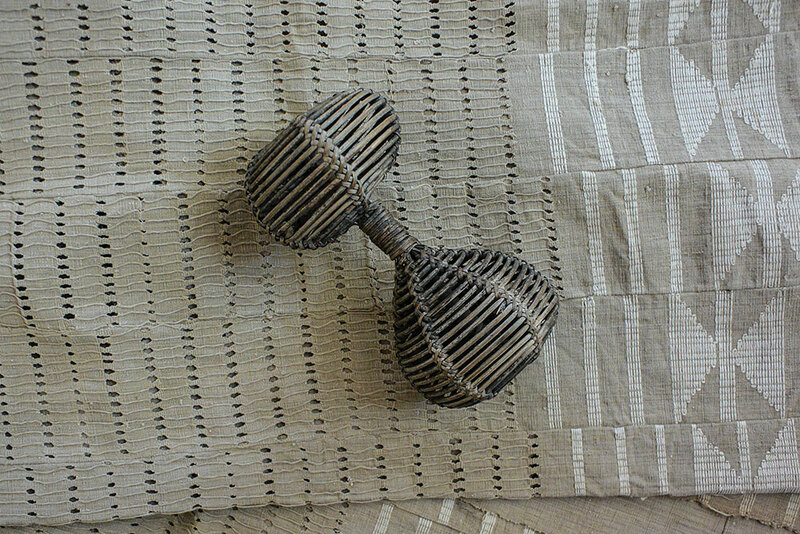 Marian Bijlenga’s untitled work of horsehair, cotton and viscose. 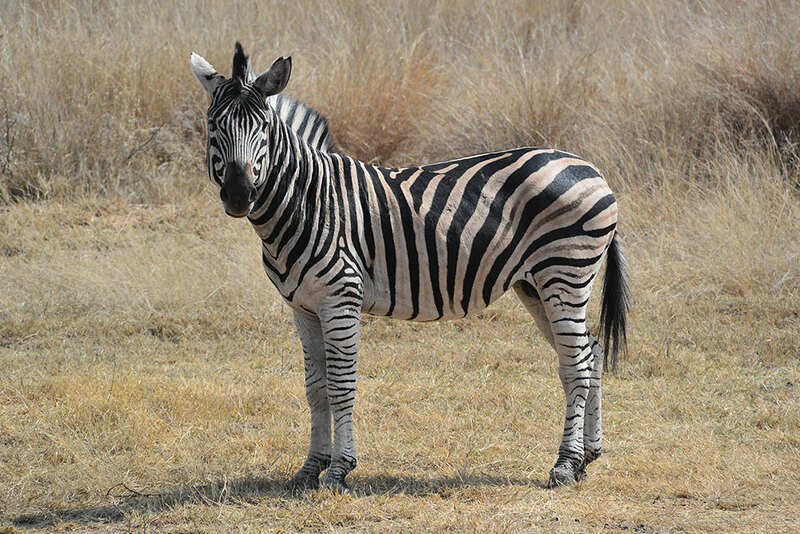 Bijlenga is one of the artists in Still Crazy as is Gyöngy Laky. Her is her work, Lefty Loosey, Righty Tighty a digital print combined with bullets for building.